Shall we explore the immortal world of the unknown? Hey there! Amy here. Don’t get too excited- I know that picture screams adventure. Draw your attention to the words below ‘Unknown’. Yup, the book version! In other words, I’m sharing three books with you today that are different, unusual, odd, etc. Let’s get right to it! I kept saying I would tell you guys about this book, but I never did! However, it really deserves it. In A World Away by Nancy Grossman, Eliza Miller is 16, and yet has never used a phone, worn jeans, or watched a movie. Why? Because she’s Amish! After much persuading, she manages to convince her strict mom to let her spend the summer as a nanny in Chicago. Of course, she meets someone(s) there, and begins to love the English world as well as her own. It all comes down to the simple question- to be Amish… Or not? Wow. It’s been a little while since I read this, but I still love it and feel all the emotions from it. I will definitely be reading this in the future (even though I was not a fan of all the characters). I also loved her choice, and knew about 5 chapters from the end that it was going to happen. I actually first found this when I was looking for a book (for the Popsugar challenge) that was based on an unknown (!) culture. I’ve always been interested in the Amish- I find it fascinating- so this was perfect. I felt like all of the reactions to new things (as well as emotions about Amish vs. English) were very realistic. Plus, Beth was totally awesome! 🙂 However, I didn’t like Josh much from the very start. He was rather… Demeaning? I think it would be? And controlling of how Eliza should act. This didn’t affect how much I liked the book, though, because I felt like not liking him added to how the story played out. I totally recommend this to everyone! It was a very fun read that covered all the high and low points of the “English” culture, as well as Amish, while teaching about the Amish ways at the same time. It’s worth your time, I promise! And can I just say, the cover??? So simple, yet beautiful, and delicate, because they’re butterflies. I think I finally understand the meaning- the jar is always open for the butterflies to come in and out, but only some choose to go. 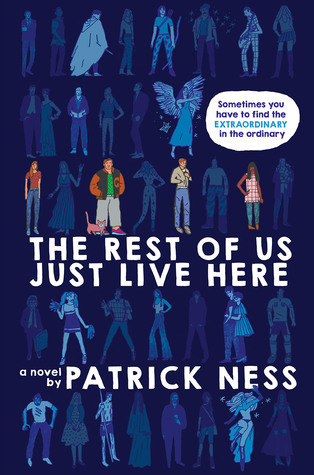 The Rest of Us Just Live Here by Patrick Ness has an unexplored topic- What if you’re not the Chosen One? The kind of person that has to fight the Titans, or Voldemort, or vampires, or demons, or whatever it may be? What if you’re just a regular kid that wants to graduate before the high school gets blown up again? As soon as I heard about this book, I couldn’t wait to read it. I was looking for something different (sometimes I feel like things can get a bit repetitive) and I definitely found it here. No one ever talks about the normal people (cough cough Hufflepuff cough cough). What fun would that be? However, Patrick Ness has managed to make the world just the right amount of ‘messed-up’ so that our ordinary characters are still entirely interesting. I feel like I’m being a little vague here. Did I like this book? Well, that’s a bit of a difficult question to answer. I liked the idea (as I’ve already mentioned). I liked how, at the beginning of each chapter, we were filled in on what was happening with the indie kids, and therefore were able to care about what happened to them as well. I liked the best friend (god of cats) whose name I seem to have misplaced, Mikey’s relationship with Mel (his sister), and Mikey’s little sister (whose name is also evading me). But… More than that, I really wanted to know what happened with Satchel. I wanted to understand her numerous relationships, and how she dealt with all the deaths, and what exactly happened with the portal. Overall? This book was okay. But, as many other reviews have said, it’s not my favorite- I’m more in love with the idea than the actual execution. However, I don’t hate it, I just think that (HUFFLEPUFF) I would be more interested if they were more… Normal? I don’t know, that sounds weird. It’s not that they’re not normal… Because everyone in today’s world has something. But all of their ‘somethings’ seem to be extra prominent. I really have no idea. In any case, it was worth the read, but not the best book ever. 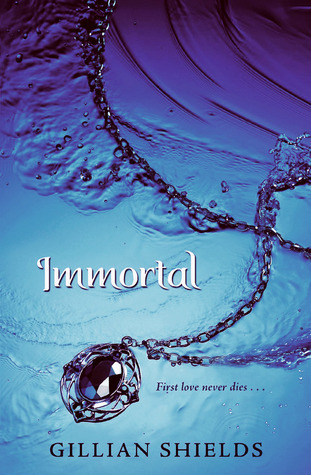 Immortal by Gillian Shields was just what my Goodreads rating says- Okay. Just okay. And in a bookworm’s world, where I have read dozens of favorite books that I will never forget, okay simply doesn’t cut it. The main character is Evie Johnson, whose mother drowned when she was very little, father is in the army, and grandmother has… Alzheimer’s? I think? I can’t remember exactly. In any case, she is sent off to the Wyldcliffe Abbey School for Young Ladies, where girls from her family have gone in the past. Since she has a scholarship (and not to mention, is taking the place of one of the girl’s dead cousin), she is immediately picked on and unliked by most. Of course, she decides not to become friends with the people (person?) who is (are?) being nice to her, and instead, begins sneaking out to see Sebastian. Who becomes her entire life. Um, no thanks! I really didn’t like Sebastian. He’s secretive, old, ******** (spoiler), not to mention forbidden. And a complete social outcast. The list goes on and on. As the book goes on, we learn that he has dabbled in the elemental forces. Not in a good way, either. My lifeline in this, frankly, boring book, was the diary of Lady Agnes. She was fairly interesting. I guess I liked the style of her writing. But in love with S.? Seriously? He’s such an idiot! And he doesn’t deserve you! Okay, I’m getting frustrated talking about this book. Not worth the read, in my opinion. I was not aware that the entire book was based on the romance, so I was not prepared and did not even have a chance to enjoy it (although I think that Sebastian is annoying enough that I wouldn’t have anyway). I hope that if any of you read this, you go in with a better level of expectations than I did, and aware that it is a romance. One last thing- WHERE ARE THE VAMPIRES???!!!??? I don’t know what it is about that cover, but it screams vampires. And there were none. This book was unknown because of a) how bland it was, and b) the concept of elemental magic, which was never really explained. Well. How did I do? One each of an amazing review, alright review, and okay review. No, really! I want to know! I like critiquing. Promise. Did I make sense? Have you read any of these? Did you like them? Do you plan to? Are you planning to because of my review? Are you not going to after reading this? Do tell! I LOVE talking about books, if this blog isn’t enough proof for you. 🙂 Make sure to scroll down a bit and say hi! Toodles! By the way, I posted a book haul- my very first- yesterday. I got 9 books for under $40! If you want to know my secret, you’ll just have to check it out. 😉 Happy reading, everyone! Hope your week went well! ‹ PreviousTHIS IS THE MOST FANTASTIC BOOK HAUL EVER!!! COME SEE!!! Thanks! I was a bit disappointed after grouping them all together. Unfortunately, I found Sebastian entirely gross and pathetic. Give it a try if you have extra time (and an extra copy), but again, it wasn’t my favorite, so… Yeah, I understand the cover, but I still feel like there should have been more supernatural action. Haha. Well, I really hope you enjoy it! 🙂 Me too. I really really really want to read The Rest of Us Just Live Here by Patrick Ness! The plot just sounds so amazing! I remember hearing about it a while ago, but I kinda forget about it until I stumbled upon it in this post! This is a great bunch of books that I’ve never heard of (except for one). I may just have to pick them up sometime!